Note: To set up DayTasks to work with your todo.txt file, you may need to make the window wider in order to see the additional options in the toolbar’s dropdown button on the right side. There is an option there to choose the folder your todo.txt file is located. 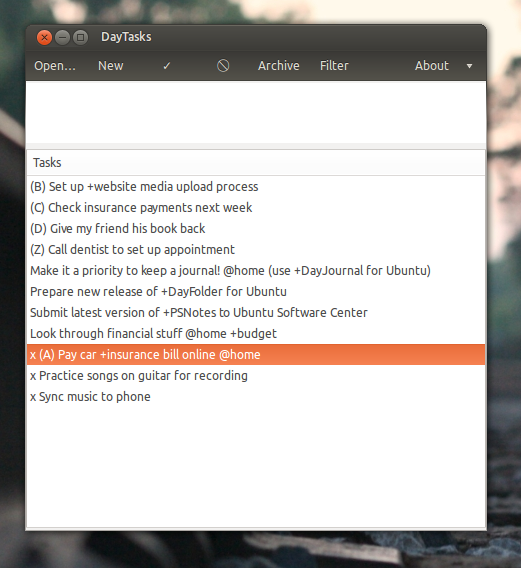 DayTasks is a minimal todo.txt-compatible app for Ubuntu. It is freely available from my ppa or for purchase from the Ubuntu Software Center (purchasing from the software center is a great way to support development of DayTasks and Ubuntu at the same time!). It lets you easily manage adding new tasks, removing tasks, marking tasks complete, archiving completed tasks to your done.txt file, and even filtering and searching through tasks in a simple way that lets you find certain projects or contexts easily. It also handles adding creation and completion dates to tasks for you. Try enabling Easy Line Breaks if you want the ability to add more details to your tasks – this is the feature I’ve always wanted to include in DayTasks. Or download the .deb files from the package details page on Launchpad. Feel free to leave any helpful comments or suggestions in the comments. Hello, I like the look of DayTasks (I purchased it in the software center because I have been looking for a good todo.txt app). I use a todo.txt file that is located in my dropbox folder for syncing with my iphone. How do I point DayTasks toward the correct todo.txt? In the screenshots I see there is a button that says Open… However, I do not see the same button in the version that I got from the USC. Hi Nick, I sent you an email to answer your question. The option has been moved to the drop-down menu to the right of the About menu item. Sorry for the confusion! Great idea, I’ll put it on my to-do list now. What theme is that? You can uninstall it just like anything else, with sudo apt-get remove daytasks. Thank you. The reason that I wanted to uninstall it was because after installing it, my Fn+UpArrow/DownArrow/Left/Right doesn’t work anymore. There are the shortcuts I usually use to minimize or maximize my window. But even after I uninstall daytasks, they still do not work anymore. Would you know the reasons? Thanks a lot. Hm, that is strange. DayTasks definitely wouldn’t have been the reason for that. Perhaps an update reset or changed your shortcut keys? You should be able to check what your shortcut keys are and change them from the Keyboard settings in System Settings. Good luck! lol I found out the shortcut. I remembered it wrong. aha gonna reinstall DayTasks. Thank you !! This is awesome. Thanks for making it. I have tried to install it on Debian Weezy with no luck. I realize it’s been created for Ubuntu, but would really appreciate some help getting it to run on Weezy. what about some navigation shortcuts. move with the arrow in the tasklist, if return is hit cursor jumps to edit field. a sort feature would be great. a special filter that shows just all @context and/or all +projekts for further filtering. how to turn off the create date automatism? Hi Alex, you can’t turn that off currently, but it’s something I should add for the next version. Good idea. How do you view the tasks in the done.txt file via the DayTask UI? Currently you cannot. I’m curious, how useful would it be and what would you be doing that for? Sorry It took me so long to reply. Being able to look at closed tasks would make it easier to provide status reports in a work environment. Any plans for making this app working in background (like in the system tray)? No plans for that. I don’t think it’s very appropriate for something like DayTasks. I tried installing DayTasks in Ubuntu 12.04 LTS, but could not. I get a dependency error about “libglib2.0-0 (>=2.35.9)” (“not satisfiable”). I tried to install libglib2.0.-0, with no luck, since a newer version is already installed. Hi, sorry about that. I will try to take a look. Do you know what package/version you have installed that’s conflicting with the libglib expected? The ability to apply more than one filter would be helpful. The android app allows this. Let me know if you want me to notify you when I get the chance to work on it so you can try it out. Yes, I’d be happy to try it out. One other thing – quitting DayTasks and restarting works for displaying an up-to-date list, but a reload button would make it a bit easier. But I agree, perhaps a button for this is in order. Sorry, I haven’t been able to find a keyboard shortcuts dialog anywhere. There’s a dropdown on the very right of the toolbar with that. Sometimes it’s hidden when the window isn’t wide enough. If you maximize the window the dropdown should show the right options. It’s something I have to fix. I just installed and can’t seem to create a new task, clicking on new doesn’t do anything. I checked permissions and they are the same as other files I own (i.e., sthompson.domain^users). Thanks for the app and the assistance. Hi, sorry you’re having trouble with it, I haven’t heard of an error like that. Does it work if you change the tasks folder and use a different location? How do I do that? Also, possibly of note, I don’t have any menus. It is one of the options listed when clicking the down arrow on the right side of the toolbar (as seen in the screenshots above, you may need to widen/maximize the window for it to show properly). Sorry about the new thread, please delete it. But to answer your question, no, it doesn’t work. Clicking on New should only just clear an active task being edited and start a new one. Does saving a task – hitting enter in the text box, or maybe ctrl+Enter – add the task? I can’t enter anything in the text box. When you hit New and then start typing, nothing happens? If so, perhaps you can provide some screenshots and we can try to figure this out via email. That’s fine. Do you have my email address? I can’t seem to locate yours. Great product. Been looking for some desktop magic as slick as the todo.txt android app. Would be great to turn off the append date feature… really hacks up my other todo.txt interfaces. Any plans for this? Thanks! Installed on Ubuntu 14.04. Program loaded a todo.txt file that is in my dropboox. Cannot change the file. When on goes to the menu all files are grayed out. Using the current version 2.82. Yup, you are not opening a file, but a directory. Then it uses the todo.txt file and will archive to the done.txt file in that directory. Because I don’t spend much time in terminal, I looked for and tried several Linux alternatives to the CLI of Todo.txt. 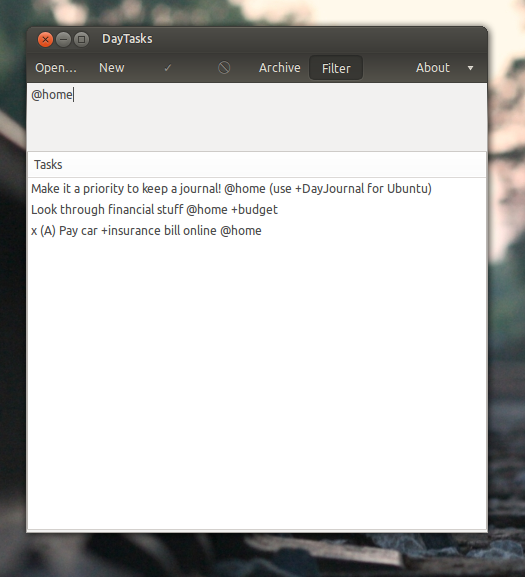 DayTasks was the easiest to set up and use straightaway. Thank you for sharing! Just discovered your software and it’s excellent, love the lightweight uncluttered ui. There’s two things I’d like to do, which might be features I haven’t discovered yet, if not then can I suggest/ vote for them please. 2- apply a sort order +/- save combinations as favourite views. I’ve seen the core todo.txt inbuilt sort hierarchy but sometimes you need a custom order. Would be very interested to see what you think. This application is pretty cool. It has minimal dependencies and a very minimalistic approach to its UI, which in my opinion totally fits the todo.txt-way of doing things. There is, however, a glaring deficit which makes it unusable for your todo.txt needs on *nix: it is not at all usable with a keyboard only. The (basic) functionality of navigating up and down my list of tasks and selecting a task (to edit, delete, etc.) is just not present – you have to use the mouse, which is unnecesarily slow and inefficient. This gets in the way of the minimalistic approach quite a bit. Also, there is no syntax highlighting at all, and auto-completion for projects and contexts is sorely missing. All in all, the alternative “todotxt-machine” just trumps this app with its functionality. Back when I made this, I built what I needed because there weren’t any suitable alternatives.. Good to hear there are more out there now! This is very good, thanks. I like the way that it sorts the lists on priority, something the todo.txt plugin for Thunderbird doesn’t do well since its definition of priorities are different to the todo.txt way. In order to make this a stable program going forwards across new distro releases (and also multi distro), would you consider making it a snap package which contains all necessary dependencies? This would not then need updating in the future. What about some automatic colors based on Priority and Due date ? Thanks for the software I like it.